�Gluten-free�Non-GMO and Nothing Artificial�Made with Fair Trade Certified�, responsibly-sourced ingredients�Vegan�5g of sugar per servingPeanut Butter Cup perfection with a happy crunch of quinoa! Unreal Dark Chocolate Peanut Butter Cups with Crispy Quinoa combine the perfect mix of textures in one satisfying treat -- with creamy peanut butter, melt-in-your-mouth dark chocolate, and crunchy toasted quinoa. 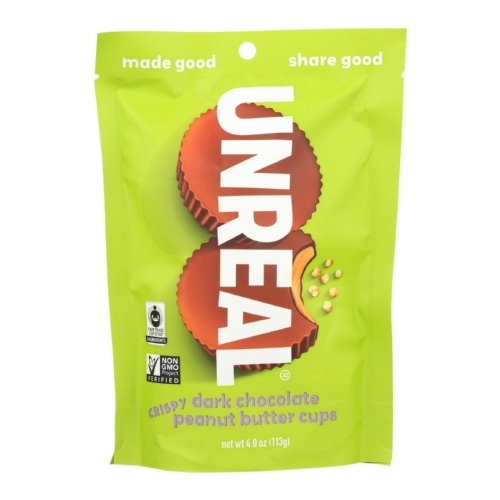 Unreal is on a mission to change the world, one snack at a time� That�s one non-gmo, nothing artificial, responsibly-sourced, fair trade ingredients, unreal tasting snack, mind you -- free of artificial flavors, dyes, and preservatives, and made only with Fair Trade Certified� and non-GMO Project Verified ingredients.